I know laws are there to keep people safe but watering restrictions really get in the way of keeping plants alive. Of course the restrictions are on sprinkling systems and such so hand watering and watering with water not from the city are still ok. This is why my rain barrels hadn't been used yet, granted they're only a little over half full now. Another way to water is tossin the ice from your drink when you are done with it at the base of the plants. It waters them and cools them down, still 104 here. With all of this I still have managed to keep my basil and beets alive and well along with a ton of weeds. We made a nice veggie soup yesterday (with chicken stock). We cut up the light part of the leeks into thin slices and sauteed it in oil with garlic until tender. Added the potato, only one, cut up into small cubes and two cups of stock. Cooked it down for a little more than 20 minutes until the veggies were soft and threw it in the blender. I also added a little shredded cheese to it to make it creamier. I should have added bacon but then it would have been even fattier so I refrained. Had it again today for lunch. With the terrible heat we've been having it's that much more important to be saving seeds. Not only are there that many less seeds out there to be had but the seeds that are available locally are more likely to be more heat resistant and able to produce in the conditions we've had. Today I'm going to pick zucchini and see what else is out in the garden that's looking good. Maybe someone out there will be willing to let me have some seeds from their crops. If not, there's still some seeds I want to put in the ground for when the heat lets up. Who knows, maybe the seeds will sprout and stay shaded under the huge squash leaves. 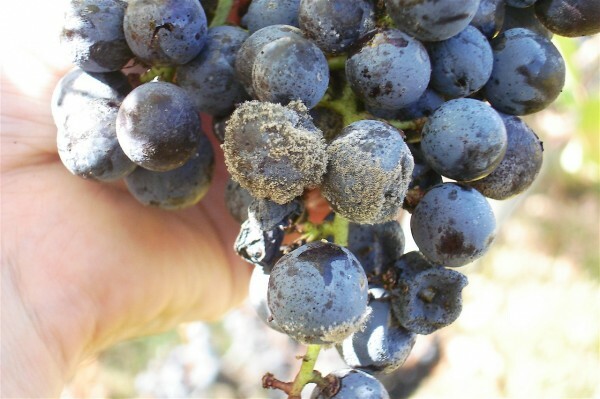 You hope sometimes that the ruined grapes aren't really ruined, that there might be some way that you can turn back the hands of time and reclaim the little balls of sweetness. 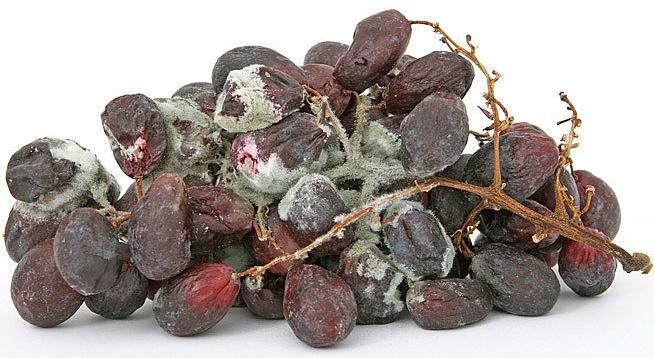 That's what happened to me at least when my wife called up and said the grapes had a blue mold all over them. On looking up what that might be I found that it may well have been the mold responsible for making one of the most used drugs out there and one of the best known, penicillin. Unfortunately she didn't wait until I could see it and in the end she thinks it was probably more white than blue. 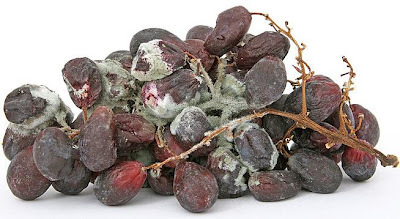 Being on dark purple grapes, and in the middle of them, I can see how that might have been the case. I wouldn't have known the difference but the top one is ok while the bottom one not so much. You can call either of the sort of white. Hard cheese I found is fine as long as you cut off the moldy part. There's something about how dense it is that prevents mold from getting too deep into the cheese. So far my zucchini plants are doing pretty well even in this heat. The ants seem to like them too, posibly because they want to get out of the heat and the moist cool leaves are a great place to do it. It's not like they're moving about a lot, they're mostly hanging out on the lower leaves in the shade. They seemed to be getting rid of another bug last time I saw them. The fairytale castle cactus is getting bigger. It still looks like just a tower, almost an inch tall, but at least it's growing. It's not meant to be an outside plant except in the spring and fall. Likes water, but not too much, and mild temperatures. The plumeria and kaffir lime tree are also in the hutch and recuperating from the heat. I'll put them back outside at the end of the month or possibly next month depending on the heat. I've kept them alive this long and really don't want to kill them off by being in too much of a hurry. Kaffir lime seeds aren't that easy to come by. I went out to the plot I have at the community garden last night and it looked like someone had taken over the plot and planted who knows what. It was dark and hard to tell from a distance. Fortunately that hadn't happened at all. What had happened is that my neighbors are really nice and keep the plot watered. The squash plant had doubled back on itself and was growing like crazy. I pulled some of the vines back off of the path which it seems to have done numerous times now and checked for produce. Nothing yet but the zucchini plant did have about a six inch fruit on it. I'll probably let that one go to the food bank and see what else comes up. Nice to finally be producing. Come fall I should have plenty of produce since the plants are nice and big. The stem on the squash plant is thicker than my thumb, and this in 100+ weather for some time. This is not the time of year to be weeding the garden. If there's weeds then you have a great protection from the unbearable heat, might be setting another record this year of most 100 degree or hotter days. The area I did remove weeds from is looking really bad now whereas the area I left the weeds alone is still looking pretty good. The basil plants and the cucumber plants are what I'm basing this off of. I've lost the basil plant already in the weeded area and the cucumber, although still alive this morning, is fading fast.